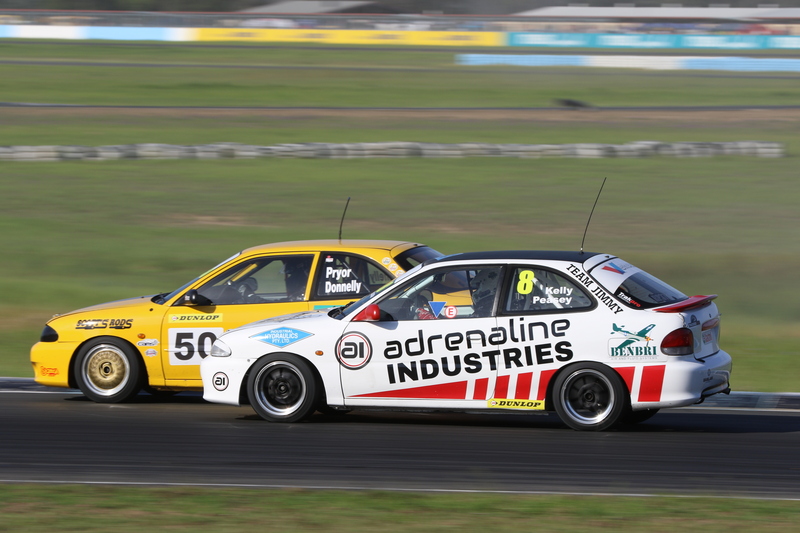 After six weeks on the sideline, the teams and drivers, of the Track Attack Australia Excel Cup, were back at Queensland Raceway, for the first of two rounds, in the space of three weeks, to determine who will be the champion for 2018. 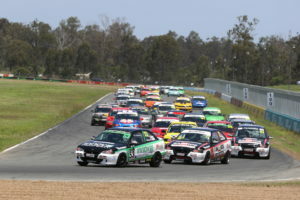 The Ipswich Classic was the setting for this round, but due to the Bushranger 200 being staged on Sunday afternoon, this seventh, and penultimate round of the season would be fought out over just two twelve-lap races, but would be contested by the biggest field of the season, with no less than FORTY-TWO cars taking to the track for Qualifying, as once again, entries came from far and wide for the biggest weekend of the Excel season. With only fifty points available this time out, Darren Whittington needed a strong performance, to ensure that the championship fight would still be on, at Lakeside Park, a fortnight later. As a result of the shortened format, and the massive field, qualifying would be more important than usual. A poor showing in the race for pole position would make for a difficult day at the office, and the risk of leaving this round with only a handful of valuable championship points. As expected, the race for pole was tight – nine cars covered by just eight-tenths of a second, but there were no surprises at the pointy end of the field, as Darren Whittington claimed his second pole position of the season, ahead of team-mate Simon Winters, who put in his best qualifying effort of the season, but it wasn’t close – Whittington had a three-tenth advantage over Winters, and the rest of the pack. Daniel Peasey was third fastest, ahead of champion-elect, Brett Parrish, and young gun, Broc Feeney. Tyrone Gautier was sixth, ahead of John Sheridan, Frank Mammarella, Luke Bremner and Gordon Smith. The outgoing Excel Cup champion, Cam Wilson, was back on the grid, for the first time since that rather forgetful June weekend at Lakeside, but he wasn’t on the pace immediately – only qualifying 17th. With forty-two cars greeting the starter, it was always going to be a sight to behold, at the beginning of race 1, but it brought with it the potential for drama. Off the start, Whittington assumed the early lead, as Winters came under immediate pressure from Peasey and Parrish. The championship lead made a terrific start, and was right alongside his two team-mates on the approach to turn 1, but wasn’t able to improve his position. The entire field survived the opening lap, but then came the carnage on lap two – a multi-car incident, at turn 1, saw Brendan Martin and Brad Carr forced into retirement, while others, including Wayne King, were involved in the incident, but escaped damage, and were able to continue on. While the race was neutralised almost immediately, it was soon suspended, as both Martin and Carr’s vehicles were stranded in the middle of the circuit. Unfortunately, for both men, the damage sustained was enough to put pay to their weekend. Just before the clampdown was called, both Brett Parrish and Broc Feeney found their way by Daniel Peasey, meaning BPRO cars would run first, second third and fourth off the restart. Marshals took around ten minutes to clear those two cars, and the associated debris off the race-track, before the field moved away from the grid for an ‘Indian file’ restart – one lap under clampdown, with the starter waving the green flag as Darren Whittington brought the field back onto the main straight, to commence lap four. The drama continued as the field left the grid, as John Carter’s car failed to fire, leaving officials scrambling to get him off the grid – before the field returned to take the green flag – which they did successfully. 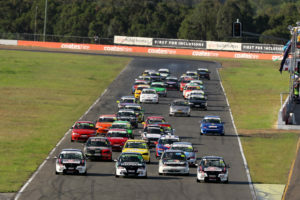 Whittington had no problem retaining his lead off the restart, but further back, the jockeying for positions was relentless – Cam Wilson, after starting 17th, found his way into 11th off the restart, while John Sheridan, Tyrone Gautier and Frank Mammarella were in a fierce battle for sixth position, and trying to close in on Daniel Peasey as well. John Sheridan was the big mover, displacing Peasey and Feeney in quick succession, and Peasey had found his way back by Feeney during that exchange as well, and wasted no time in getting Sheridan back either. Feeney was feeling the pressure, with Mammarella, Gautier and Seiton Connor-Young all closing in, and just behind that pack was Cam Wilson, who’d finally broken into the top ten. Just outside the ten, Jaylyn Robotham was being pursued by Dave Shinners and Mick McCloud. Robotham started 15th, and was quietly moving his way forward. The race was neutralised for a second time, following an incident involving Ashley Izod and Chris Wilkins. Izod was able to get her car to the safety of ‘The Dipper’, but Wilkins’ vehicle was buried in the sand, and that’s what triggered the clampdown. James Van Roon was also caught up in that incident, however, he was able to continue on, but not before a detour via pit-lane, for a safety check. On resumption, the race was extended to 15 laps, to compensate the laps completed under clampdown conditions. Prior to the stoppage, Whittington had built up a one-second lead over his BPRO team-mates, as they continued to hold the first three positions in the motor race. Off the restart, Gautier and Feeney completely missed the jump – they were both passed by Wilson and Connor-Young. Things got worse for Feeney, as he visited the dirt, and lost seven places in the process. Feeney’s mistake saw Robotham enter the top ten for the first time. Up front, Brett Parrish, with an awesome run off turn two, breezed by Simon Winters, who lost three car-lengths on the back straight, as he was forced to settle for third position, and watch the team boss go out in pursuit of their team-mate, Darren Whittington. 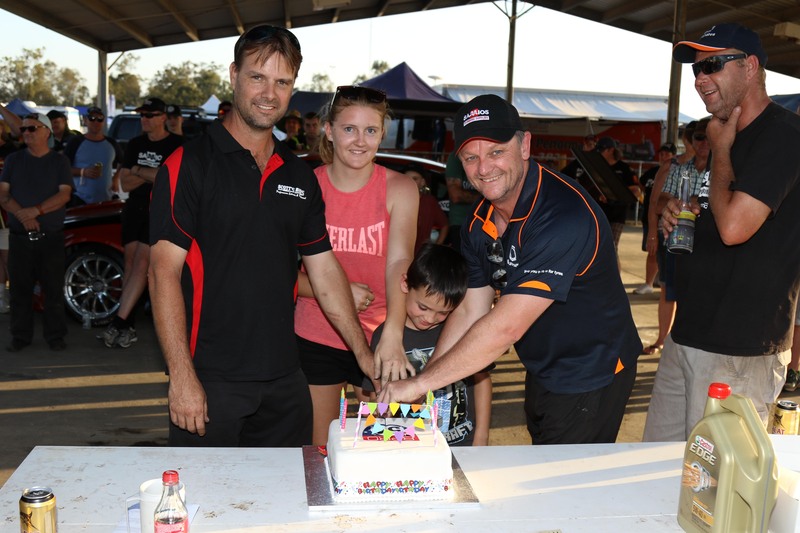 On the penultimate lap, John Sheridan found his way by Daniel Peasey, to take fourth place, while the third of the Phillips Wilson Racing squad entries, Ronnie Conquest, was forced into retirement – and was parked up in Snake Gully. Back at the front though, it was Darren Whittington claiming his sixth win of the season, after leading every lap of the race, to get the job done, ahead of Brett Parrish and Simon Winters, in the first 1-2-3 for the BPRO squad in 2018. Fourth place went to John Sheridan, who clocked the fastest lap of the race, ahead of Daniel Peasey and Frank Mammarella, who was well clear of Cam Wilson, Tyrone Gautier, Seiton Connor-Young and Jaylyn Robotham, who rounded out the top ten. The drama continued after the chequered flag was waved, with no less than four drivers excluded post-race. 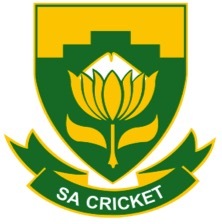 Peter Nankervis was excluded for passing during the clampdown period, while Luke Bremner, Matthew Gilmour and James Van Roon were all excluded for weight infringements. 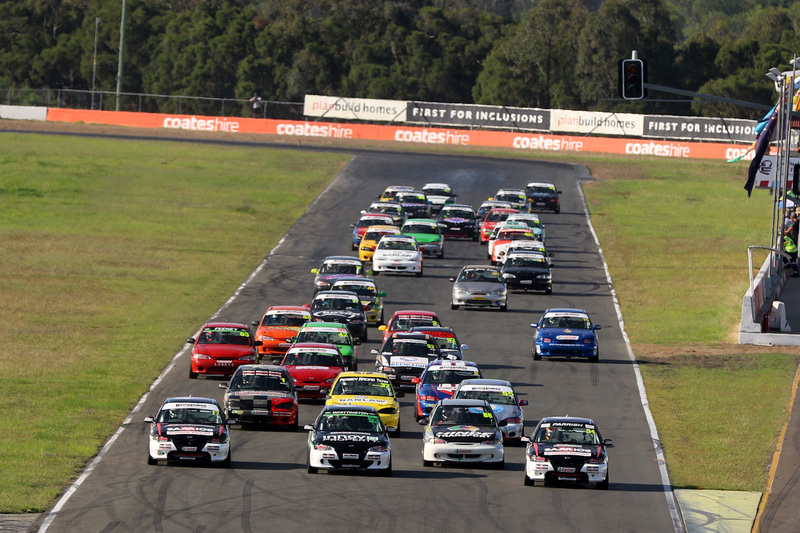 Thirty-nine cars took to the circuit for the second race of the day – the final one of Round 7 of the season. Darren Whittington was slow off the start, which allowed Brett Parrish to lead the field into turn one. Whittington settled into second, ahead of Sheridan and Wilson, who both got the better of Simon Winters in the early stages. Unlike the earlier race, the field didn’t get through the opening lap unscathed. In Snake Gully, Seiton Connor-Young was turned around, forcing the balance of the field to take evasive action. Broc Feeney and Dave Shinners were also involved. Shinners and Jason Haren ventured to pit-lane at the end of that opening lap – Shinners for a safety check, and Haren to serve a drive-through penalty he was handed at the end of the previous race. Jaylyn Robotham was the big winner in the early laps, moving from 10th to 5th before the end of the second lap. He made light work of Cam Wilson, to move into 5th place, and his work was far from done, as he then went out in pursuit of Simon Winters and John Sheridan. 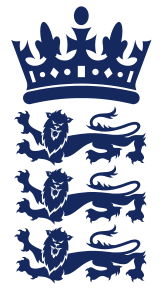 Robotham made light work of Winters, and was immediately piling the pressure on Sheridan and Whittington, who was still trying to find his way back past his team-mate, and suddenly, we had a five car fight at the head of the field. 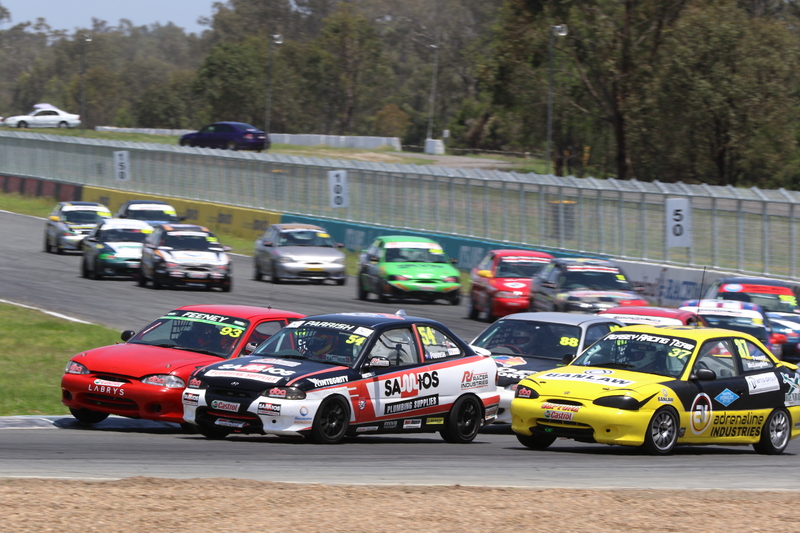 Robotham found his way to third on the same lap that Whittington reclaimed second, after getting by John Sheridan. 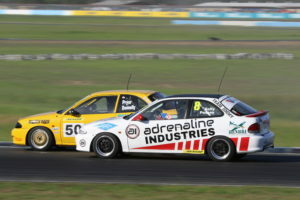 Once Whittington got by, Sheridan lost out to both Robotham and Winters on the very same lap – all of a sudden, second became fifth, and he was no longer fighting for a podium finish. Behind them, Daniel Peasey had fallen down to ninth place, behind Gordon Smith, and just ahead of Robert Buckley, who’d charged through from the rear of the field, to sit tenth with six laps to go. Unfortunately, things only got worse for the #37 entry – Peasey was forced to retire on lap eight, effectively ending any chance he had of finishing second in the championship this season. Whittington finally regained the race lead on lap nine, when he found his way past Parrish, but the championship leader restored order on lap ten, only to lose the lead again on lap 11. Both drivers were chasing their seventh win of the season, and weren’t about to give up easily. In the end though, despite his best efforts, Parrish was forced to settle for second, as Darren Whittington claimed his seventh win of the season, and another round win as well. Second for Parrish meant that, although his advantaged had been trimmed by four points, he still maintained a very healthy points lead, going into the season finale. Third place for Jaylyn Robotham – a statement that he’d be one to watch in the Bushranger 200. 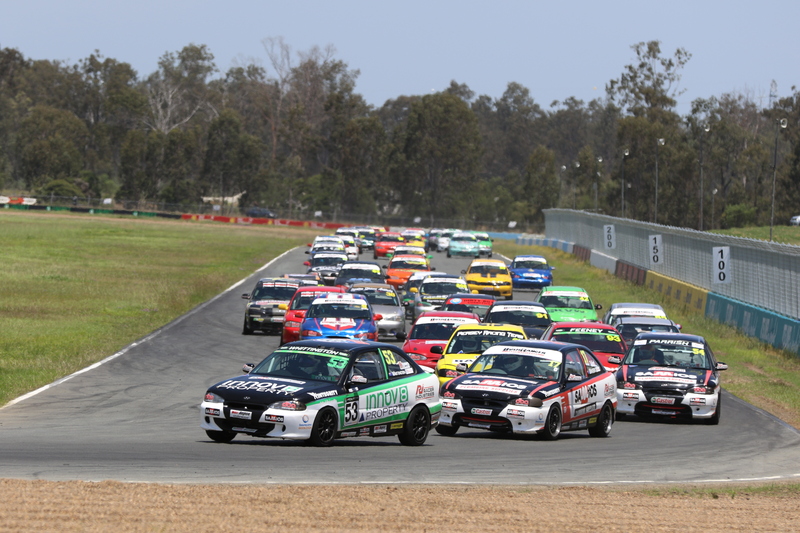 Simon Winters and John Sheridan rounded out the top five, while Frank Mammarella, Gordon Smith, Robert Buckley, Cam Wilson and Mick McCloud made up the lower-half of the ten. That was one of Smith’s best finishes of the season, and for Robert Buckley – he moved up 31 positions in just twelve laps, in one of the drives of the season so far. 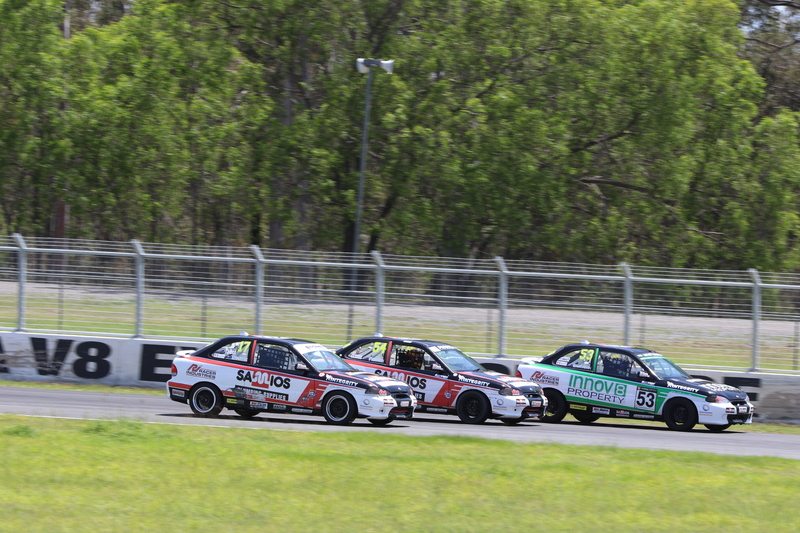 More drama post-race, yet again, with no less than SIX cars thrown out for infringements, including Matthew Gilmour, Luke Bremner, Daniel Pearson, Darren Currie, James Van Roon and Xander Antonieff. With two wins, from as many starts, Whittington secured round honours – his third of the season, ahead of Parrish and Winters. 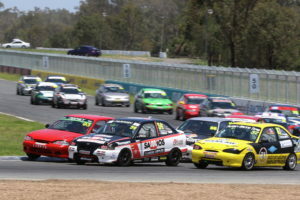 John Sheridan was fourth, in what was his best round result since Round 1, and – speaking of best results – Jaylyn Robotham, in his only Track Attack Australia Excel Cup appearance of the season, scored fifth for the round – a nice confidence booster heading into the Bushranger 200, which was his main focus this weekend. A one-two-three for the BPRO Squad, and Brett Parrish holds a near unassailable 70-point lead, heading into the final four races of the season, where only 100 points are on offer. All roads will lead back to Lakeside Park, back to where this season started, for the 2018 Track Attack Australia Excel Cup season finale, in just a fortnight from now.